Order your Remo Fiberskyn 3 Frame Drum from AMS and enjoy Fast & Free Shipping. Get the Best Deal with our Lowest Price Guarantee & Great Customer Service! 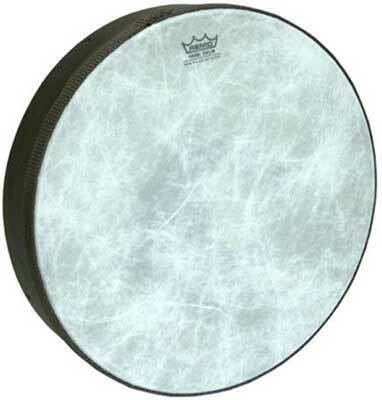 The Remo Fiberskyn 3 Frame Drum features a wide body shell and a thumb notch with four holes located around the circumference of the Acousticon shell. The four holes are placed in a manner allowing the use of many materials such as rope, string, leather or vinyl strips to create a handle that would suspend the drum and increase the projection when struck with a mallet or hand. All frame drums are equipped with a Remo drumhead and are manufactured with Remo’s patented Acousticon shell that produces the same tonal characteristic found on traditional wood shell drums with excellent projection and enhanced low-pitched fundamentals. The end result is a light weight, durable, weather-resistant and easy to play frame drum for countless hours of jamming. made vary well the product is going tro replace the traditional hand drum made by first nation's.